With the innovative aerial robotic team developed by the EU-funded AEROWORKS project, users can safely inspect infrastructure and perform maintenance tasks using autonomous drones. The ageing infrastructure found in both developing and developed countries, coupled with the gradual expansion of distributed installations, means the costs of inspection and repair has grown incessantly. To address this critical need, highly automated, efficient and reliable solutions are required to not only reduce costs, but also minimise risks to personnel and the assets themselves. But doing so requires a major paradigm shift by the industry. The EU-funded AEROWORKS project set out to be that paradigm shift. "AEROWORKS developed an innovative aerial robotic team capable of autonomously conducting infrastructure inspection and maintenance tasks while also providing their human operators with an intuitive, user-friendly interface," says Project Coordinator George Nikolakopoulos. The resulting AEROWORKS robotic team represents a new class of Unmanned Aerial Vehicles (UAVs), or drones. Dubbed 'Collaborative Aerial Robotic Workers', these specialty UAVs are equipped with dexterous manipulators, novel physical interaction and co-manipulation control strategies, perception systems and planning intelligence. Operating in a decentralised fashion, the AEROWORKS multi-robot team is characterised by unprecedented levels of reconfigurability, mission dependability, mapping fidelity and manipulation dexterity – all integrated into robust and reliable systems that are rapidly deployable and ready-to-use as an integral part of infrastructure service operations. For the first time ever, AEROWORKS has demonstrated the concept of the collaborative autonomous aerial inspection of infrastructure using multiple UAVs. Whether it be a wind turbine or chimney, the AEROWORKS system creates the necessary trajectories for the ARWs. Based on these trajectories, the drones can fly autonomously, perceiving the environment and avoiding obstacles, and perform a full visual reconstruction of the infrastructure. With this reconstruction in hand, the user can easily identify the exact location of any defects and start repairs. Thanks to AEROWORKS, the costs of these inspections and repairs have been dramatically reduced and the safety of inspectors significantly increased. "This is one of the most important achievements of the project, one that has pushed the limits of what aerial robotics is capable of," says Nikolakopoulos. "By enabling the concept of Aerial Robotic Workers, we introduced novel application scenarios that were previously never even thought of." According to Nikolakopoulos, AEROWORKS has challenged the status quo of what UAVs can do by taking them outside the scientific laboratory and into the field. "We broke the comfort zone of the autonomous UAV community by delivering a concept of autonomous aerial inspection and maintenance in real life applications, fully connected with real industry needs," he says. "This has paved the way for a massive utilisation of drones in the form of Aerial Robotic Workers." 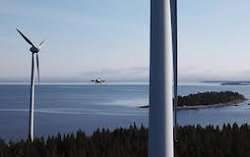 Specifically, AEROWORKS demonstrated the applicability of ARWs in the aerial inspection of such infrastructure as wind turbines. This accomplishment alone will not only boost Europe's infrastructure, it will also give the European service and industrial robotics sector a competitive edge. "With Europe leading the way, AEROWORKS is drastically altering the landscape of how aerial robots are used," adds Nikolakopoulos. In 2017, the Royal Academy of Engineers in Sweden recognised the project as one of the year's most significant engineering achievements. Since the project's close, researchers have been contacted by multiple end-users who are interested in autonomous aerial inspections. To better accommodate this increasing need, the project has created a number of spin off companies.